The 72-year-old singer had undergone "emergency oral surgery" on Monday night (08Feb16), although the reasons behind the operation are not clear. Following a performance in Memphis, Tennessee on Thursday as part of his farewell One Last Time! Tour, Barry had to be rushed back to Los Angeles due to complications stemming from the surgery. The news was announced on Barry's Facebook page, with the statement adding he may well be forced to miss the Grammy Awards next Monday (15Feb16), where his newest album My Dream Duets is up for best traditional pop vocal album. "Manilow's concerts in Highland Heights scheduled for Thursday (11Feb16) and Nashville (12Feb16) are being re-scheduled with new dates to be announced shortly," the statement read. "Ticket holders should retain their existing tickets for redemption on the night of the new date. "At this time it is unclear if Manilow will be able to attend the Grammy Awards on Monday, February 15th where he is nominated for his 15th Grammy Award for his latest album, My Dream Duets." Barry had previously spoken of his pride about the fact that My Dream Duets has been recognised with a Grammy nomination. However, he laughed that he will most probably lose out on the gong to Tony Bennett. "Everybody loses to Tony Bennett, and (his album) The Silver Lining: The Songs of Jerome Kern is a really great album," Barry told Billboard magazine. "This Grammy nomination (for My Dream Duets) is a big surprise. I thought it was a great piece of work. It's really special. It was a technical marvel, what these guys did to make it sound like I'm standing in the same room as Andy Williams. It's amazing, so I'm really proud of it no matter what happens." Barry's health has been hitting headlines in recent months, with reports last month (Jan16) that he was fighting for his life after being airlifted to Los Angeles' Cedars-Sinai Medical Center. His rep was quick to dismiss the health scare, adding that stories linking his latest alleged health issues to heart palpitations which led to emergency care in October (15) are false. 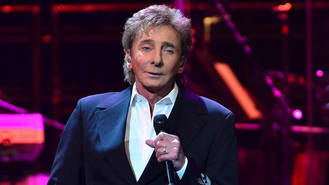 "Mr Manilow was not airlifted to Cedars with a heart attack," the rep told Access Hollywood. "It is indeed an established fact that Mr Manilow does have atrial fibrillation, but he has never had a heart attack nor is this a concern."